WEST PALM BEACH, Fla. (AP) — Republican Florida Gov. Ron DeSantis suspended a Democratic county elections supervisor Friday who failed to meet deadlines during recounts after November’s election, but her supporters said the move was unwarranted and political. DeSantis said Palm Beach elections supervisor Susan Bucher violated state law by not completing recounts before a state mandated deadline and by mishandling ballots. The county’s aging ballot counting machines had been certified by the state but broke down repeatedly during the recount. Bucher is a former state representative who has held the elections position since 2008. DeSantis named Republican lawyer Wendy Link to replace her. A raucous crowd watched the announcement, with about 20 Bucher supporters cursing and shouting at the governor while DeSantis supporters cheered the decision. Florida had recounts in three statewide races: governor, U.S. Senate and agriculture commissioner. Palm Beach’s machines could handle only one recount at a time. A legislative seat also required a recount in the county. “Palm Beach County stands alone in that level of ineptitude. 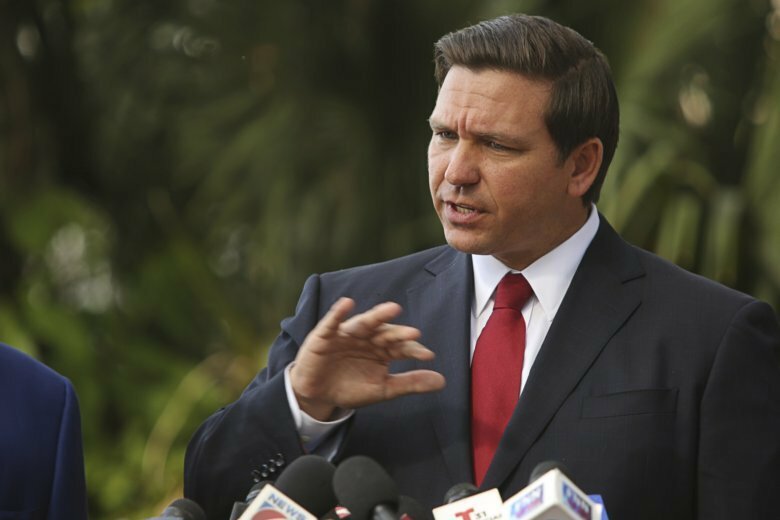 They’ve truly been the Keystone Cops of elections administration,” DeSantis said. Palm Beach County also drew international attention during the 2000 presidential recount under a Bucher predecessor over the “butterfly ballot” it used then, a faulty design that likely confused some voters. Bucher didn’t immediately return a call seeking comment. Palm Beach County Tax Collector Anne Gannon, a Bucher supporter, said Bucher told her she intends to fight the suspension either in the courts or before the Senate. DeSantis contrasted Palm Beach County with Bay County, which was struck by Hurricane Michael, a Category 4 storm, less than a month before the election. He said the process there went smoothly despite the destruction. Palm Beach has 1.6 million residents, while Bay has 170,000. Bay elections supervisor Mark Andersen let about 150 voters cast ballots by email and fax in the heavily Republican county, a violation of state law. DeSantis said he would not suspend Andersen for that. This was the third suspension DeSantis has ordered since taking office Jan. 8. Last week, he suspended Broward County Sheriff Scott Israel over his handling of February’s mass shooting at Marjory Stoneman Douglas High School that left 17 dead. He also suspended Okaloosa County Schools Superintendent Mary Beth Jackson over allegations that administrators had covered up the physical abuse of special education students by teachers.